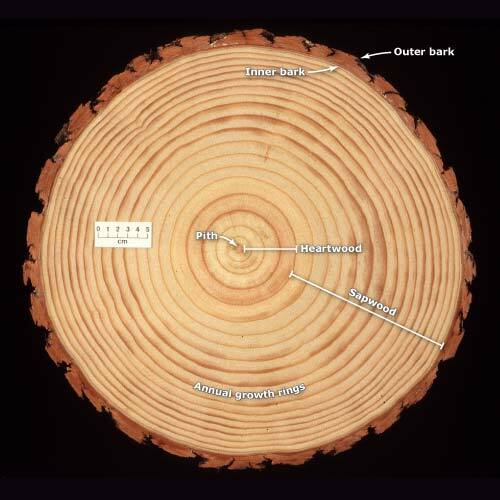 The three main sections of a pine log are an outer layer of bark, a circle of sapwood and a core of heartwood. Bark consists of outer layers of dead cells and an inner layer of live, dividing cells. Bark has a protective function, helping prevent attack by insect and fungal pests, and stopping the interior of the trunk from drying out. The wood is made up of concentric rings, which each represent a year’s growth. Each ring is composed of thin-walled cells (the paler wood) and thick-walled cells (the dark circular lines). A new layer of wood is added each year in a very thin region between the inner bark and the sapwood. Sapwood consists of live cells that carry and store water and nutrients. Heartwood is dead and is a darker colour than the surrounding sapwood. Pith is the oldest part of the tree and forms the core of the trunk.